The Nikon Coolpix 4100 is an affordable entry-level digicam featuring a 4-megapixel sensor, 3x optical zoom lens, and a variety of shooting modes. As a point-and-shoot camera, the 4100 does not have advanced exposure controls, metering options, or ISO settings. Instead, it offers basic recording modes such as Auto, 15 preset scene modes, and a video mode that can record movie clips at 640x480 with 15 fps. For those who prefer AA based cameras, the Nikon 4100 looks very attractive as it accepts Alkaline/NiMH or CR-V3 batteries. 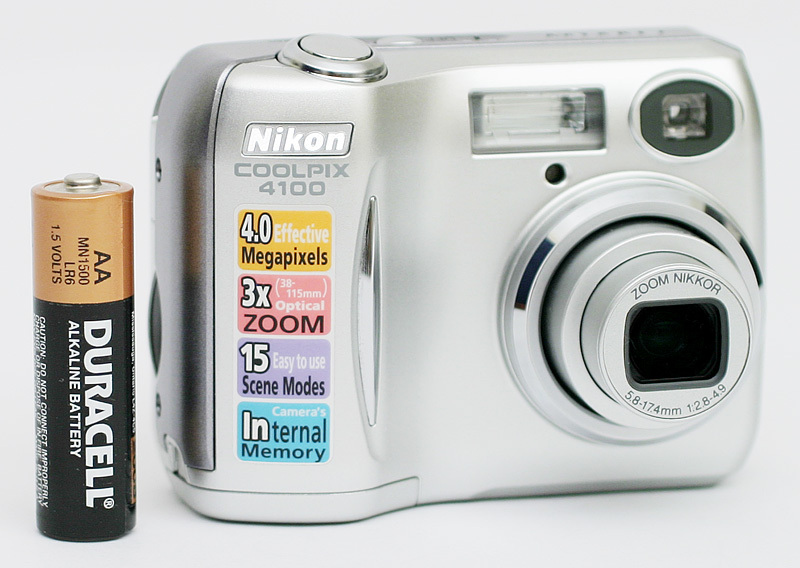 As a relatively inexpensive 4 megapixel digicam, the Nikon Coolpix 4100 looks very promising. In our review, however, the Coolpix 4100 put in a fairly average performance overall. From startup to cycle times, this camera is certainly not a speed demon. However, it does have very respectable shutter lag/focus times. We liked the long battery life and AF-assist lamp to help the camera focus in very low-light conditions. However, the image quality leaves something to be desired. Our sample pictures suffer from a grainy quality as well as subtle JPEG artifacting and jaggies. Upon inspection of the average file size, it is clear that the Coolpix 4100 simply over-compresses its images. Read our full review of this camera to see if it meets your needs.